Today you’ll learn how to install our recently released GraphHopper Routing Engine 0.11 with JDK 11 that was released today. # use a custom JDK with: ./install-jdk.sh -u "https://..."
This is our GraphHopper Maps demo application and it uses the web service at localhost:8989/route, which is documented here. You can see that not only A-to-B routing is supported but also isochrone requests at localhost:8989/isochrone, calculating the reachable area from one location. 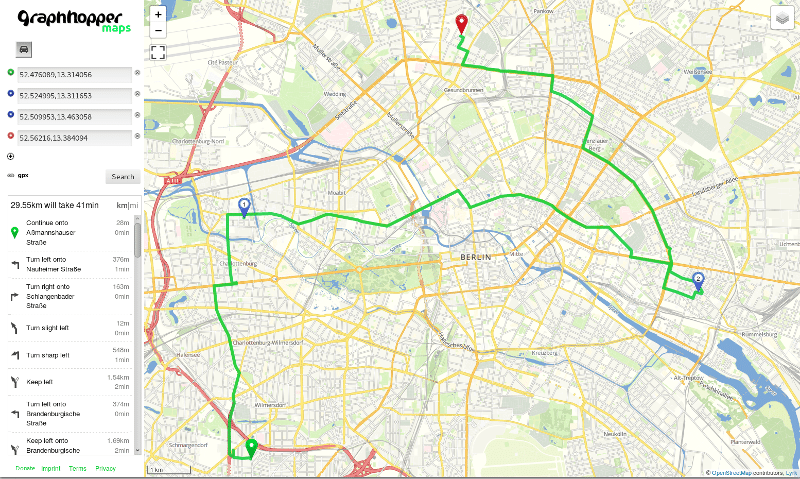 The tiles are fetched from an external service as well as the geocoding is done by Nominatim, not GraphHopper. For production usage tiles can be bought from Thunderforest, Omniscale or MapTiler Cloud and Geocoding could be done using the GraphHopper Geocoding API that also supports autocompletion. You can find an always up-to-date installation documentation in the Readme. Another potential simpler way to get started is to use this Dockerfile and maybe change the JDK to 11. Be patient. This will take slightly longer to start as for every profile we precalculate helper files to make routing fast even on a continental scale. After you refreshed the browser you’ll see an elevation window in the bottom right corner and different vehicle profiles in the top left. To make this work with a world wide coverage you download the necessary planet file from OpenStreetMap and walk through this deployment guide.